Your Amazon.com account lets you add multiple shipping addresses: not just for you, but for anyone to whom you ever send a package, gift or otherwise. 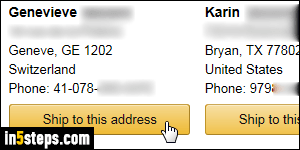 Your Amazon address book will automatically remember each address unless you delete it afterwards. 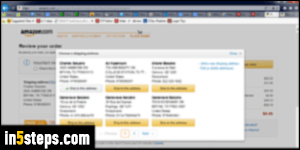 I'll show you how to change the shipping address for an order you are placing, and how to change your default shipping address so that it's automatically selected whenever you buy something from Amazon. Let's say that you filled your cart, and are checking out: just proceed up to the final screen, where you see the "Place your order" button on the right. At that point, click on the "Change" link next to the Shipping address on the left. For digital Kindle eBook orders, you can also change the default device or app. A popup opens, showing all the shipping addresses you've ever added. To ship to one of these, click on the corresponding "Ship to this address" button. To add a new shipping address for this order (and future ones), click on the "Add new shipping address" link on the right. Back on the checkout screen, "Check this box to default to these delivery and payment options in the future" only if you want Amazon to also remember the payment method as default! 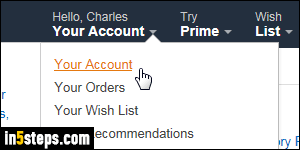 To change your default shipping address when you aren't placing an order, go to Amazon.com, mouse over the "Your Account" dropdown button on the right, and select "Your Account". 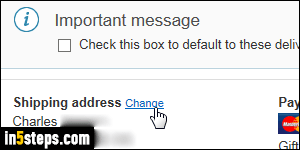 Under Settings (third group of options), either click Add new address to create a new one, or on the Manage address book link otherwise. I'll click on the second, since you now know how to add a new shipping address from the checkout screen! Find the address you want as default, and click on "Click here to make this your default shipping address, including 1-Click and gifting". On the right, you can assign a different payment method to each shipping address. 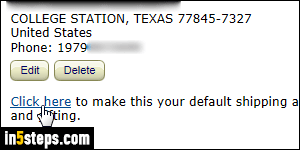 You can pretend-check-out to confirm that the default shipping address was in fact selected. Tip: know that you can completely disable Amazon 1-click ordering.